This term at our school we are learning all about Little Critters, bugs, creepy crawlies, insects, arachnids, slugs and snails. Creatures that make up 97% of the animal kingdom. Recently at school we have also been having some major building work take place. So we decided to write a script about a cockroach called Colin whose home at school is about to be demolished. His mother sets him the task of finding a new home but there are distractions along the way. See if you can guess what the moral of the story is. A Cautionary Tale from KPE TV on Vimeo. This is our entry in the Manaiakalani Film Festival. Last term we were learning about Mighty Mariners and our group had to research Leif Erickson and present what we had found out. This is the movie we made about him. Litia, Rita, Shoal and Vivienne. (Thanks also to Starford for the Eric the Red graphic. Leif Erikson from KPE TV on Vimeo. As part of our Immersion Week we got into groups and had to research a particular mariner Ms Squires gave us. Our groups had to create animations and a movie to show the rest of the class what we had found out about them. Christopher Columbus by Waata, Crusader, Gabriel and Kingston. On Friday the 3rd of June we had some people come from the rugby academy. Their names were Villi, Michael, T, Sam, John and one more of their mates whose name I don't know. 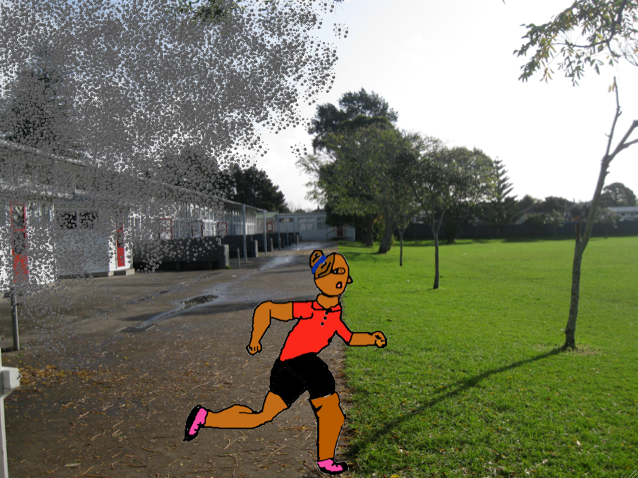 We had Michael and Villi to train with while the others went to train with the other classes. First we did some relays where we had to move the ball around our body and under our legs. Starford's team won most of them. (They were team three). Our next activity we did was just normal running relays. 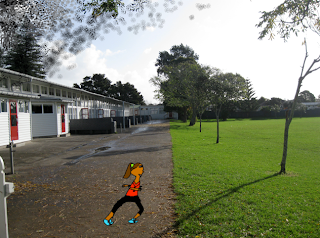 After that we did some more running relays but this time when we got to the cones we had to do five star-jumps. Waata cheated because he just went up and down. Groups 1 and 2 then had to join lines to play a game called pass the boxing bag. Groups 3 and 4 had to do the same. We were having so much fun as we passed the boxing bag along the line. I was at the end of the line and I had to run back with it. It was quite heavy and difficult to run with. Versing Starford was hard because he is one of the strongest in the class and he is the fastest. Villi then taught us a new game called run around. Run around is a game where you have to run around until Michael calls out a number. Sprinting as fast as we could you had to look for that number in a group like if he calls out three, you have to get into groups of three. We played two games. The winners of the first game were Rita and Oshania. The winners of the second game was Starford and Kobe. The next game we played was bull rush. In the first game Starford and Mary were in and the second game Kobe and Rita were in. They had to choose a colour and if we had that colour we had to try make it to the other end. The winner of the first game was Te Rina. The winners of the second game were Oshania and Me. Next we had to say goodbye to the Rugby Academy people because we had to give the other rooms a turn to train. We then went on to the bottom field to play touch and have some more fun. The people who didn't do their homework had to sit down by the edge of the playground. Eventually we had a turn to play with only 5 minutes to go. What a fun day we had with the Rugby Academy people come and visit. I wish they could come and visit again because I play for the school and want some more tips about playing rugby. "Miss Squires what are those people doing making hamburgers?" I asked suspiciously as I looked at the people sizzling patties. Right after that Miss Squires got everyone to line up. We were going to the hall. When we got there we sat down and just waited. I could hear everyone chattering with excitement. Suddenly everyone all went silent as a man came running up the aisle and jumped up onto the stage. "Hi guys" he shouted. We all shouted back at him saying hi. It sounded like there was a big lion roaring. After the loud noise died down the man introduced himself and said that his name was Eddie. After that another person came onto the stage. Her name was Sarah. Eddie told us that they were playing hide and seek with Iron Brian. "Who is that"? I asked smiling. After that we shouted and made as much noise as we could, suddenly a man dressed up in a suit with a really fat head jumped out from the side of the stage. I got a fright. It was Iron Brian. Then he revealed where he was hiding. Iron Brian told us that he was hiding behind the girls toilets. "Ooh" all the boys said. Finally they told us exactly why they were here. It was because we were going to learn about the good meats to eat. So they had about four or five big cards that were facing ore backwards on the stage. As soon as they were finished explaining Sarah turned over the first card. It had a picture of Iron Brian saying meat and meat alternatives. After that Iron Brian told us that red meats were better than white meats. Red meats are better because they have more iron. The red meats are steak and beef and other things like that. But the white meats are fish and chicken. When Sarah flipped over the next card it said fruit and vegies. I like fruit but I'm not that crazy about vegies. My least favourite vegetable is beans. But I don't hate every vegetable. If I have to choose a favourite I would say carrots. They are nice and juicy. Anyway the next card was dairy products. So that included milk,youghurts and cheese. Dairy food is very good for you because it has calcium which makes your bones strong. And finally the last card was of course cereals and bread, that is one of the the things that we can eat in the morning. That was the last card I was getting tired. But then we had to get up and do a dance. I let out a loud sigh and stood up. First we learnt the dance and then we did it with music. When we learnt it we were split into groups and had a little competitition. Finally the show was over, there was still one more surprise. Everyone was going to get free burgers. Yummy!!! So we got up and went outside to get our burgers. They were delicious. I hope Iron Brian comes again. 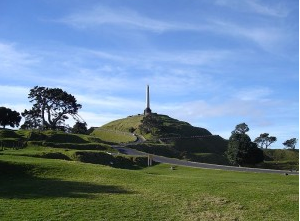 The other week Rooms 14, 15, 16, 17 and 18 went on a trip to one of Auckland's many volcanoes, One Tree Hill. Here is Ashleigh's recount of the day. I just remembered that today we were going to go to One Tree Hill.We went to One Tree Hill because long ago one tree hill was a volcano. Luckily it wasn't raining because we would have been soaking wet. Suddenly we all went on the bus ready to go to one tree hill. Then we arrived. The classes were all going to go to three types of places at different times. One place was the learning centre the two other places were when we played a game and when we climbed up the mountain. 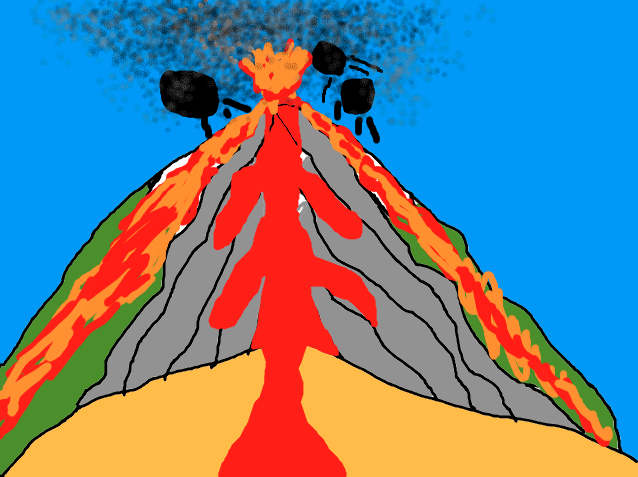 First my group went to the leaning centre to learn more about how volcanoes are formed and lot more information. One of the things that I learnt was that One Tree Hill has been around for about 20 000 years. As soon as I heard that I said "Wow that is a long time". Right after that we got to see a movie that showed us what one tree hill looked like when it erupted. Eventually we finished our lesson and it was time that we were going to climb the mountain. It was a hard time while trying to get up but I managed to do it. Before I knew it I was on the top of the mountain. I was proud of myself because I had got this far. So we all had a little rest. Now we were all ready to go down. As soon as we got down we got to the down and ate our lunch. After we ate our lunch we all played a game called Capture the Flag while waiting for the bus to come.The bus came and we were ready to go back to school. I had fun going to One Tree Hill. I hope when you go there you will have fun. This term our school's topic is called Active Earth. We have been learning all about what the Earth is made of and how volcanoes, earthquakes and tsunami's happen. Chante, Raenan and Vivienne wrote a script for a movie explaining all about what they have found out about the Earth so far. Here is their movie. 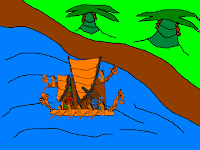 Room 15 have been finding out about the Early Europeans who came to NZ. We read about the Whalers and Sealers, Missionaries, Settlers and Traders. 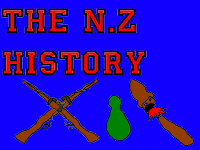 We wrote scripts as if we were one of these people and recorded our scripts with our animations of the European ships arriving in NZ playing in the background. Here are the ones that were finished and played on P.E.N.N. our school news programme. Room 14 and 15 were playing a game called capture the flag. Capture the flag is a easy but tactical game to play. First Miss King precisely explained the rules and the roles to us. In the beginning we got divided into teams.Everyone in room14 and 15 all had different roles to do like guarding the flag area, running to get the flag and rescuing.I keep on getting out but luckily Darius kept on gratefully rescuing me. We got the first three points. I had to run after my opponent because he had the flag. I heard lots of people shouting "Spartans".We got five scores and room14 got one score. At the end of the game we celebrated by picking up rubbish. We won that too. I felt excited playing Capture the flag because that was my first time playing it. Here is the final goodbye to Room 15 2009 and for the record, the photo of our blog as it looked then. We wish everyone all the best in their new classes and look forward to keeping up with their blogging. Check out their links still on our sidebar. Welcome also to our new Room 15. It is now Week 2 and it has been fantastic getting to know you all. I'm sure we are going to have a wonderful year together.